In biological systems, extracellular vesicles including exosomes have recently been revealed to play a significant role in the communication between various cells, and the number of papers on this subject has dramatically increased. In current conventional exosome studies, the standard research method is to use liquid biopsies to analyze extracts of various disease exosomes. However, exosomes are only one of many key players in natural cellular interactions. Reproducing the phenomena occurring in vivo and investigating the interactions are required in order to examine their role fully. For exosome research, an alternative to the liquid biopsy method for observing natural interactions is the co-culturing technique. It does not require an exosome extraction procedure, and while the technique has been used in many studies thus far, its application to exosome research has been limited. However, the use of co-culturing technologies is necessary to examine the essential interactions of exosomes. An overview of exosome research methodologies and co-culturing systems is thus provided here. Folds of the cerebral cortex (gyri and sulci) are among the most important properties of the mammalian brain. Uncovering the physiological roles, developmental mechanisms and evolution of the cortical folds would greatly facilitate our understanding of the human brain and its diseases. Although the anatomical features of the cortical folds have been intensively investigated, our knowledge about their molecular bases is still limited. To overcome this limitation, we recently established rapid and efficient genetic manipulation techniques for the brain of gyrencephalic mammal ferrets (Mustela putorius furo). Using these techniques, we successfully uncovered the molecular mechanisms of cortical folding. 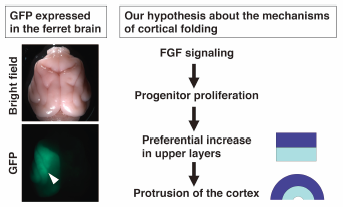 In this article, I will summarize our recent research on the molecular mechanisms of development and diseases of cortical folding. Nicotine, an addictive substance, is absorbed from the lungs following inhalation of tobacco smoke, and distributed to various tissues such as liver, brain, and retina. Recent in vivo and in vitro studies suggest the involvement of a carrier-mediated transport process in nicotine transport in the lung, liver, and inner blood–retinal barrier. In addition, in vivo studies of influx and efflux transport of nicotine across the blood–brain barrier (BBB) revealed that blood-to-brain influx transport of nicotine is more dominant than brain-to-blood efflux transport of nicotine. Uptake studies in TR-BBB13 cells, which are an in vitro model cell line of the BBB, suggest the involvement of H+/organic cation antiporter, which is distinct from typical organic cation transporters, in nicotine transport at the BBB. Moreover, inhibition studies in TR-BBB13 cells showed that nicotine uptake was significantly reduced by central nervous system (CNS) drugs, such as antidepressants, anti-Alzheimer’s disease drugs, and anti-Parkinson’s disease drugs, suggesting that the nicotine transport system can recognize these molecules. The cumulative evidence would be helpful to improve our understanding of smoking-CNS drug interaction for providing appropriate medication. Prostaglandin (PG) E2 is a well-established lipid mediator that plays a role in diverse functions and diseases of the brain. Cyclooxygenase and PGE synthase have been extensively studied as molecular determinants of extracellular concentration of PGE2 near prostanoid E receptors since the brain has limited capacity of PG metabolism. There is accumulating evidence that several members of the solute carrier (SLC) and ATP-binding cassette (ABC) superfamilies regulate PGE2 distribution in brain capillary endothelial cells, choroid plexus (CP) and arachnoid epithelium, and different parenchyma cells such as neuronal and glial cells. These transporters may mediate entry and exit of PGE2 at blood–brain and blood–cerebrospinal fluid boundaries, resulting in brain distribution of PGE2. However, their roles in neuroinflammation and disease progression remain unclear. 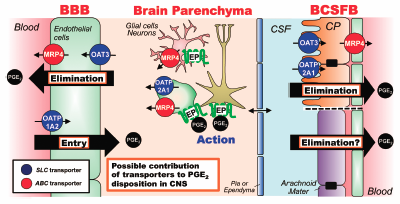 In this review, current knowledge on transporters involved in brain distribution of PGE2 is summarized, and especially, potentials of organic anion transporting polypeptide (OATP) and organic anion transporter (OAT) family members are discussed as molecular determinants of PGE2 concentration in the brain. The molecular states of ketoprofen and the interaction between ketoprofen and other pharmaceutical excipients in the matrix layer were examined to determine their effect on the pharmaceutical properties of original and generic ketoprofen dermal patches (generic patches A and B). Molecular states of ketoprofen were evaluated using polarized light microscopy, Raman spectroscopy and powder X-ray diffraction. For the original ketoprofen patch, crystalline components were not observed in the matrix layer. However, crystalline ketoprofen was observed in the two generic ketoprofen patches. Moreover, the ketoprofen exhibited hydrogen bonding with the pharmaceutical excipients or patch materials in the generic products. Skin permeation of ketoprofen from the patches was evaluated using hairless mouse skin. Twelve hours after application, the original patch demonstrated the highest level of cumulative skin permeation of ketoprofen. This was followed by generic patch B while generic patch A showed the lowest level of permeation. Fluxes were calculated from the skin permeation profiles. The original patch was approx. 2.4-times faster compared with generic patch A and approximately 1.9-times faster compared with generic patch B. This investigation suggested that pharmaceutical properties such as skin permeability for these types of products are affected by the precipitation of crystalline ketoprofen in the matrix layer and the interaction of ketoprofen with the pharmaceutical excipients or patch materials. The intestinal barrier dysfunction is a critical pathological change in irritable bowel syndrome (IBS). The objective of this study was to evaluate the effect of Prim-O-glucosylcimifugin (POG) on intestinal barrier dysfunction and reveal possible molecular mechanisms. Human colon adenocarcinoma cell line (Caco-2) cell monolayers induced by tryptase (TRYP) were used to establish an intestinal barrier dysfunction model. Caco-2 cell monolayers from both functional and dysfunctional samples were treated with POG (30, 60 and 120 µg/mL) for 2, 8, 24, 36, 48 and 72 h. The Caco-2 cell monolayers were assessed by measurement of trans-epithelial electrical resistance (TEER) and percentage of fluorescein permeation (PFP). The expression of Protease Activated Receptor 2 (PAR-2) and myosin light chain kinase (MLCK) mRNA was analyzed by RT-PCR and the level of Zonula Occludens-1 (ZO-1) protein expression was determined by Western blot. In addition, the impact of POG on the distribution of the tight juction protein of Occludin was performed by immunofluorescence. Our results showed that POG elevated the TEER and decreased the PFP of the functional Caco-2 cell monolayers, as well as the dysfunctional Caco-2 cell monolayers. Furthermore, POG inhibited the expression of PAR-2 mRNA and MLCK mRNA and increased the level of ZO-1 protein expression in dysfunctional Caco-2 cells. The distribution of the Occludin proteins was ameliorated simultaneously. 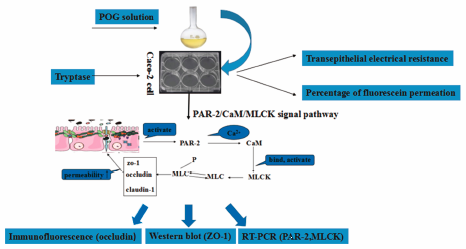 This study demonstrates that POG can enhance the intestinal barrier function of Caco-2 cell monolayers by inhibiting the expression of PAR-2 and MLCK and up-regulating the expression of ZO-1 protein, and ameliorated the distribution of Occludin protein. Calcium alginate (Ca-Alg) is known to suppress the postprandial increase of blood glucose, and therefore may be helpful for preventing lifestyle-related diseases such as diabetes. In this work, we examined the mechanism of this effect. As α-amylase activity and α-glucosidase activity are involved in the digestion of starch, we examined the in vitro inhibitory effect of Ca-Alg on these enzymes. Ca-Alg showed little inhibition of α-amylase, but markedly inhibited α-glucosidase activity. The direct binding affinity of glucose for Ca-Alg was low. Also, Ca-Alg had essentially no effect on the membrane permeability of glucose. Therefore, we considered that the suppression of blood glucose by Ca-Alg is predominantly due to a decrease in the efficiency of starch digestion as a result of inhibition of α-glucosidase, possibly due to increased viscosity of the gastrointestinal contents. Next, we investigated the optimum amount in the diet and the optimum particle size of Ca-Alg for suppressing postprandial blood glucose level in rats orally administered a diet containing starch with various amounts and particle sizes of Ca-Alg. We found that 5% by weight of 270-mesh-pass Ca-Alg was most effective. We conducted a prospective, randomized, double-blind, 3-group, 3-phase crossover study to evaluate the effect of calcium alginate (Ca-Alg) on the postprandial increase of blood glucose in 15 healthy adult subjects who were given udon noodles containing or not containing Ca-Alg (5 or 8%). The value of ΔCmax (difference between the maximum (Cmax) and pre-feeding (C0) blood glucose levels) was significantly reduced in both Ca-Alg groups, and the area under the blood glucose level–time curve over 120 min (ΔAUC, with C0 as the baseline) was also significantly reduced. Thus, supplementation of noodles with Ca-Alg significantly suppressed both the peak postprandial blood glucose level and the total amount of glucose absorption. Blood calcium (Ca) concentration was significantly increased at 120 min after ingestion, but there was no marked change of other parameter values. A questionnaire indicated that addition of Ca-Alg did not affect the acceptability of the noodles. These results indicate that Ca-Alg might a useful food additive for helping to prevent lifestyle-related diseases without adversely affecting individual eating habits. Piceatannol, a naturally occurring stilbene derivative mainly found in grapes, possesses apoptotic activity in various cancer cell lines, in addition to potent antioxidant activity. In the current study, we showed that piceatannol exhibits potent cytotoxic effects in all tested leukemia cell lines (THP-1, HL-60, U937, and K562). These effects were accompanied by induction of DNA damage, an increase in the proportion of cells in the sub-G1 phase of the cell cycle, and inhibition of reactive oxygen species (ROS) generation. However, N-acetyl-L-cysteine (NAC), a strong ROS scavenger, significantly inhibited piceatannol-induced apoptosis, suggesting that piceatannol-induced apoptosis does not occur via inhibition of ROS generation. Piceatannol also resulted in a significant increase in mitochondrial depolarization, along with a decline in Bcl-2 expression, which was not restored by NAC. Conversely, ectopic Bcl-2 overexpression moderately inhibited piceatannol-induced apoptosis. Furthermore, piceatannol strongly inhibited X-linked inhibitor of apoptosis protein (XIAP) expression, which was restored by NAC. 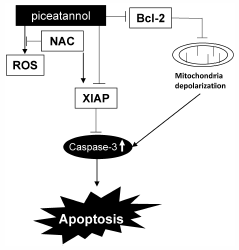 A transient knockdown of XIAP significantly increased piceatannol-induced apoptosis in the presence of NAC, suggesting that XIAP downregulation increases piceatannol-induced apoptosis, and that NAC could reverse this effect by increasing XIAP expression. Taken together, these results suggest that piceatannol induces apoptosis in human leukemia cell lines by downregulating XIAP expression, regardless of antioxidant activity. Previous studies have shown that hyperglycemia is connected to the malignant progression of breast cancer; however, the effects of hyperglycemia on tumorigenic potential in breast cancer cells are largely unknown. 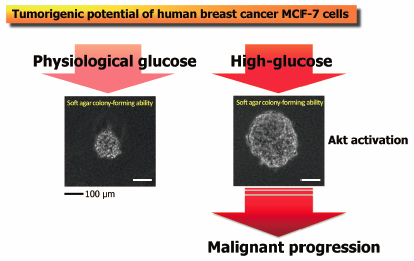 Here, we demonstrated that the ability of the human breast cancer cell line MCF-7 to undertake anchorage-independent colony growth was significantly enhanced when cultured under high-glucose conditions compared with that under physiological glucose conditions. The high-glucose conditions also promoted phosphorylation of Akt, suggesting that MCF-7 cells cultured in these conditions acquired an increased ability to undergo anchorage-independent growth at least in part through Akt activation, which has been linked to the development of breast cancer. These results raise the possibility that regulation of Akt activity contributes to the tumorigenesis of breast cancer under high-glucose conditions, and we propose that additional analyses of high glucose-induced tumor formation would provide novel strategies for the diagnosis and therapy of breast cancer with hyperglycemia. Docosahexaenoic acid (DHA, 22 : 6) is an essential omega-3 long-chain polyunsaturated fatty acid that plays a pivotal role in vision. The purpose of this study was to clarify the cellular uptake and binding processes of free and protein-bound unesterified DHA in retinal pigment epithelial cell (RPE) line ARPE-19 as a model of the human outer blood–retinal barrier and isolated porcine RPE cell fractions. Uptake of free [14C]DHA by ARPE-19 cells was saturable with a Michaelis–Menten constant of 283 µM, and was significantly inhibited by eicosapentaenoic acid, arachidonic acid, and linoleic acid, but not by oleic acid. Further, the uptakes of [14C]DHA associated with retinol-binding protein ([14C]DHA-RBP), [14C]DHA associated with low-density lipoprotein ([14C]DHA-LDL) and [14C]DHA associated with bovine serum albumin ([14C]DHA-BSA) in ARPE-19 cells increased time-dependently at 37°C, and were significantly reduced at 4°C, suggesting the involvement of energy-dependent transport processes. [14C]DHA-LDL uptake by ARPE-19 cells was significantly inhibited by excess unlabeled LDL, but not by an inhibitor of scavenger receptor B type I. Fatty acid transport protein (FATP) 2 and 4 mRNAs were expressed in ARPE-19 cells, and [14C]DHA uptake was observed in FATP2- and FATP4-expressing Xenopus oocytes. Photo-reactive crosslinking and mass spectrometry analyses identified 65-kDa retinal pigment epithelium-specific protein (RPE65) as a DHA-binding protein in porcine RPE cell membrane fractions. Thus, RPE cells possess multiple cellular transport/binding processes for unesterified DHA, involving at least partly FATP2, FATP4, LDL, RBP, and RPE65. Cells induce heat shock proteins (HSPs) against various stress. However, murine erythroleukemia (MEL) cells do not express HSP72, a heat-inducible member of HSP70 family. So, it is of interest to examine how MEL cells respond to heat stress (44°C, 30 min). 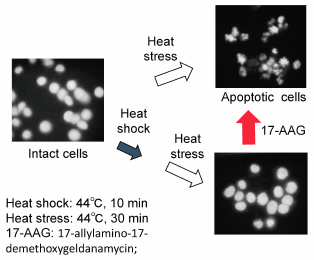 Heat stress-induced apoptosis was suppressed by pretreatment of heat shock (44°C, 10 min). Such suppressive effects were maximal at 6 h after heat shock and remained up to 12 h. Interestingly, such effects of heat shock were abrogated by specific inhibitors of HSP90 such as 17-allylamino-17-demethoxygeldanamycin (17-AAG) and novobiocin. From flow cytometric analysis, it was found that MEL cells arrest in G2 phase at 6 h after heat shock, but restore original cell cycle at 12 h. High expression level of HSP90 was maintained before and after heat shock. Phosphorylation of HSP90α was observed in apoptotic cells induced by heat stress, but inhibited by pretreatment of heat shock. Such inhibition was abrogated by 17-AAG. Moreover, c-Jun NH2-terminal kinase (JNK) was activated in heat stress-induced apoptotic cells. Taken together, these results suggest that HSP90α in MEL cells plays an important role in the thermotolerance, i.e., suppression of heat stress-induced apoptosis by heat shock. The present study aims to investigate the roles of steroidogenic acute regulatory protein (StAR) in Yangjing Capsule (YC) induced anti-apoptotic effects on Leydig cells and the related mechanism. Leydig tumor cells (MLTC-1) were cultured and treated with YC, and immunofluorescence assay was performed to examine the expression of StAR; furthermore, luciferase reporter assay was conducted to evaluate the impact of YC on StAR promoter; next, MLTC-1 cells were treated with StAR small interfering RNA (siRNA), and flow cytometry was carried out to examine the effect of StAR siRNA on the apoptosis of the cells; furthermore, quantitative (q)RT-PCR and Western blot methods was used to determine the expression of StAR and apoptosis related molecules Bcl-2, Bax and Caspase-3 on both mRNA and protein levels in different groups; finally the secretion of testosterone in different groups was examined by radioimmunoassay. 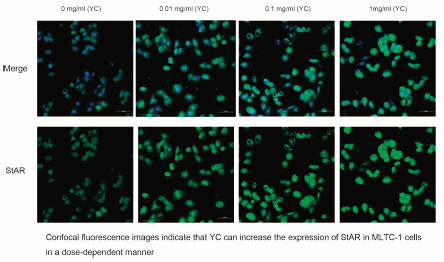 We observed that the YC can increase the expression of StAR in a dose-dependent manner, and YC can activate the promoter of StAR; moreover, transfection of StAR siRNA can block YC induced anti-apoptotic effects and increased production of testosterone. In conclusion, our results suggested that YC might suppress the apoptosis of MLTC-1 cells and enhance the production of testosterone through regulating the expression of StAR. The aim of the present study was to investigate the protective effects of Shenfu injection (SFI) against myocardial ischemia–reperfusion injury (MIRI) in model rats and to explore its mechanism of action. 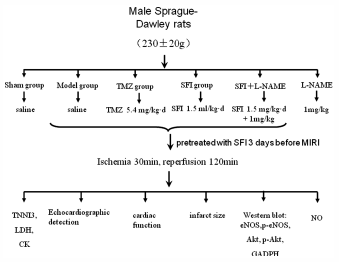 Sprague–Dawley (SD) rats were pretreated with SFI and NG-nitro-L-arginine methyl ester (L-NAME) via tail vein injection and then rats were subjected to ischemia by occlusion of the left anterior descending coronary artery for 30 min followed by reperfusion for 120 min. Left ventricular function was evaluated by echocardiography. Hemodynamic was measured by the Millar pressure–volume system; serum creatine kinase (CK), lactate dehydrogenase (LDH) and serum troponin (TNNI3) levels were determined. Myocardial infarct size was observed by 2,3,5-triphenyl-2H-tetrazolium chloride (TTC) staining; p-Akt/Akt, and p-endothelial nitric oxide synthase (p-eNOS)/eNOS levels were assessed by Western blotting; nitric oxide (NO) content in serum was determined by the Griess reaction. SFI significantly decreased serum CK, LDH and TNNI3 levels in MIRI rats, while it significantly increased the level of left ventricular systolic pressure (LVSP), left ventricular diastolic pressure (LVDP), maximal rate of the increase of left ventricular pressure (+dp/dtmax), maximal rate of the decrease of left ventricular pressure (−dp/dtmax), left ventricle ejection fraction percentage (EF), and stroke volume (SV). In addition, SFI significantly reduced myocardial infarction area and activated the phosphorylation of eNOS via Akt. The phosphorylation of eNOS and the concurrent increase of NO production contributed significantly to the protective effects of SFI. These results demonstrate that SFI protects the rat heart against MIRI and that this effect is mediated in part by Akt/eNOS signaling. Methotrexate (MTX) is used widely as a first-line drug for the treatment of rheumatoid arthritis (RA) worldwide. There are large interindividual differences in the therapeutic response to MTX, but it is not known which factors influence them. We therefore investigated predictive factors associated with the therapeutic response to MTX in a hospital-based cohort study. Japanese adult RA outpatients prescribed MTX were enrolled and their characteristics were collected from the electronic medical records. The European League Against Rheumatism (EULAR) response criteria were used as the response to MTX therapy. The observation period was 1 year after beginning MTX administration. Sixteen types of single-nucleotide polymorphisms were investigated using the real-time PCR method. Associations between the MTX response and patient characteristics were evaluated using the multivariate logistic regression model. Among 70 Japanese adult RA outpatients, 52 were classified as MTX responders. In multivariate analysis, patients with the solute carrier family 19 member 1 (SLC19A1) 80G>A A/A genotype had a better response than those with the A/G or G/G genotype, and patients with the C allele of γ-glutamyl hydrolase (GGH) 16T>C had a better response than those with the T/T genotype.This study showed that the therapeutic response to MTX in Japanese RA patients was associated with the genetic polymorphisms of SLC19A1 80G>A and GGH 16T>C in actual clinical practice. Recent studies suggested that excessive T helper (Th)1/17 cells concomitant with regulatory T cell deficiency might play important roles in Crohn’s disease. Anti-cluster of differentiation 52 (CD52) monoclonal antibody (mAb), which aims on CD52 antigen on mature immunocytes, has both T cell depletion and immunosuppressive activities. In this study, we evaluated the therapeutic effects and possible mechanisms of anti-CD52 treatment on interleukin-10 (IL-10) deficient mouse. Anti-mouse CD52 mAb was administered to C3H/HeJBir.IL-10−/− (C3H.IL-10−/−) mice intraperitoneally 20 µg per week for 2 weeks. The disease activity index, body weight, the histological grading of colitis, and levels of tumor necrosis factor (TNF)-α, interferon (IFN)-γ, IL-17 and IL-6 in colon were quantified after treatment. In addition, CD25, Forkhead box P3 (Foxp3) and transforming growth factor (TGF)-β gene as well as the percentage of CD25+Foxp3+ T cells in colon were also measured. The severity of colitis in IL-10−/− mice was significantly decreased by the treatment, with improvement of colon histological grade. The treatment also decreased the TNF-α, IFN-γ, IL-17 and IL-6 levels in colon. Furthermore, the treatment up-regulated the mRNA expression of CD25, Foxp3 and TGF-β gene as well as the percentage of CD25+Foxp3+ T cells in colon lamina propria mononuclear cells (LPMCs) of IL-10−/− mice. 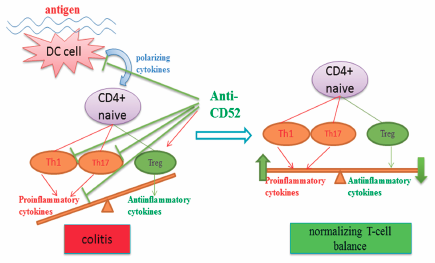 Our data might indicate that anti-CD52 treatment could ameliorate the colitis of C3H.IL-10−/− mice and it might be related to the suppression of Th1/17 related inflammation and the promotion of regulatory T cell differentiation. Thus, our data reveals that anti-CD52 treatment may hold potential for clinical applications for Crohn’s disease treatment. Tribulus terrestris L. (Zygophyllaceae) (TT) is usually used as a cardiotonic, diuretic, and aphrodisiac, as well as for herbal post-stroke rehabilitation in traditional Chinese medicine. However, little is known about the renoprotective effects of TT on obesity-related glomerulopathy (ORG). In this study, 340 monomeric compounds were identified from TT extracts obtained with ethyl acetate combined with 50% methanol. In vitro, IC50 of TT was 912.01 mg/L, and the appropriate concentration of TT against oxidized-low density lipoprotein (ox-LDL) induced human renal glomerular endothelial cells (HRGECs) was 4 mg/L. TT significantly increased the viability (63.2%) and migration (2.33-fold increase) of HRGECs. ORG model rats were induced by a chronic high-fat diet (45%) for 20 weeks and were then treated with TT extract (2.8 g/kg/d) for 8 weeks. Subsequently, the kidneys were removed and their differentially expressed protein profile was identified using two-dimensional electrophoresis coupled with matrix-assisted laser desorption/ionization-time of flight (MALDI-TOF)-TOF MS. Molecular categorization and functional analysis of bioinformatic annotation suggested that excessive energy metabolism, decreased response to stress and low immunity were the potential etiologies of ORG. After TT administration for 8 weeks, body weight, blood pressure, serum cystatin C and cholesterol were decreased. Additionally, TT significantly enhanced the resistance of rats to ORG, decreased energy consumption and the hemorrhagic tendency, and improved the response to acute phase reactants and immunity. In conclusion, TT may play a protective role against ORG in rats. The significant correlation between nasal symptom scores and level of histamine H1 receptor (H1R) mRNA in nasal mucosa was observed in patients with pollinosis, suggesting that H1R gene is an allergic disease sensitive gene. We demonstrated that H1R and interleukin (IL)-9 gene are the allergic rhinitis (AR)-sensitive genes and protein kinase Cδ (PKCδ) signaling and nuclear factor of activated T-cells (NFAT) signaling are involved in their expressions, respectively. Honey bee products have been used to treat allergic diseases. However, their pathological mechanism remains to be elucidated. In the present study, we investigated the mechanism of the anti-allergic effect of royal jelly (RJ) and Brazilian green propolis (BGPP). Treatment with RJ and BGPP decreased in the number of sneezing on toluene 2,4-diissocyanate (TDI)-stimulated rats. The remarkable suppression of H1R mRNA in nasal mucosa was observed. RJ and BGPP also suppressed the expression of IL-9 gene. RJ and BGPP suppressed phorbol-12-myristate-13-acetate-induced Tyr311 phosphorylation of PKCδ in HeLa cells. In RBL-2H3 cells, RJ and BGPP also suppressed NFAT-mediated IL-9 gene expression. 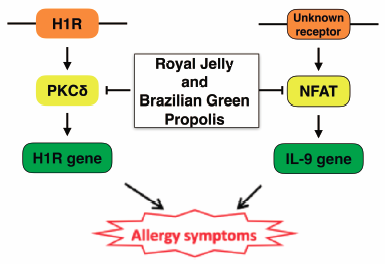 These results suggest that RJ and BGPP improve allergic symptoms by suppressing PKCδ and NFAT signaling pathways, two important signal pathways for the AR pathogenesis, and suggest that RJ and BGPP could be good therapeutics against AR. Oligoarginines (Rn) are becoming promising tools for the intracellular delivery of biologically active molecules. 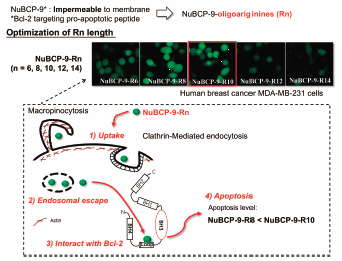 NuBCP-9, a peptide that induces apoptosis in B-cell lymphoma 2 (Bcl-2)-expressing cancer cells, has been reported to promote the uptake and non-specific cytotoxicity of R8, also called octaarginine. However, it is unknown whether a similar synergistic effect can be seen with other Rn. In this study, we conjugated NuBCP-9 with various Rn (n=8, 10, 12, 14) to investigate and compare their cellular uptake characteristics. In addition, their non-specific cytotoxicity and apoptosis-inducing abilities were evaluated. We found that NuBCP-9 conjugated with Rn enhanced cellular uptake mainly through clathrin-mediated endocytosis and macropinocytosis, and that the uptake pathways were not different from those used by unconjugated Rn. However, the cytotoxicity study showed that NuBCP-9-R12 and NuBCP-9-R14 conjugates enhanced non-specific cytotoxicity. We found that NuBCP-9-R10 conjugate had the highest uptake efficiency and induced correspondingly high levels of apoptosis, while resulting in a tolerable degree of non-specific toxicity. Effects of selenium supplementation on atopic dermatitis (AD) were investigated by administering seleno-L-methionine (SeMet) using a mouse model of AD caused by repeated application of 2,4,6-trinitrochlorobenzene (TNCB). BALB/c mice were sensitized with TNCB to the abdomen on day −7; then, TNCB was applied repeatedly to each ear three times a week from days 0 to 23. SeMet was orally administered to the mice from days 0 to 23. The efficacy of SeMet on AD was assessed by measuring ear thickness, histologic evaluation, serum total immunoglobulin (Ig) E levels, and expression of interleukin (IL)-4 in the ear and superficial parotid lymph node. Ear thickness was remarkably increased by repeated application of TNCB, and SeMet significantly suppressed ear thickness in BALB/c mice. SeMet inhibited epidermal hyperplasia and dense infiltration of inflammatory cells. The number of TNCB-induced mast cells was significantly decreased by SeMet. Serum total IgE levels that increased by the repeated application of TNCB were significantly suppressed by SeMet. Repeated application of TNCB induced expression of IL-4, a T-helper (Th) 2 cytokine, in the ear and superficial parotid lymph node of BALB/c mice and its expression was significantly inhibited by SeMet. These results demonstrated that SeMet supplementation suppresses AD-like skin lesions in BALB/c mice and inhibits the expression of total IgE and IL-4. Seleno-L-methionine (SeMet) is a major form of selenium compounds in foods. The article by Arakawa et al. demonstrated that ear thickness was increased by repeated application of 2,4,6-trinitrochlorobenzene (TNCB) to the ear, and SeMet significantly suppressed ear thickness in mice. SeMet inhibited epidermal hyperplasia and dense infiltration of inflammatory cells. Serum total immunoglobulin (Ig) E levels were suppressed by SeMet. Interleukin (IL) 4 expression in the ear and superficial parotid lymph node was inhibited by SeMet. These results demonstrated that SeMet suppresses atopic dermatitis-like skin lesions and inhibits the expression of total IgE and IL-4. Upon differentiation of cells, remarkable changes in the structures of glycans linked to lipids on cell surface have been observed. Lactosylceramide (Lac-Cer) serves as a common precursor for a series of glycosphingolipids with diverse structures. In the present study, we examined the underlying mechanism for the biosynthesis of Lac-Cer upon differentiation of 3T3-L1 mouse preadipocytes to adipocytes. TLC analysis showed that the amounts of Lac-Cer decrease in 3T3-L1 adipocytes compared to 3T3-L1 preadipocytes. In accordance with this change, the gene expression level of β4-galactosyltransferase (β4GalT) 5, which was identified as Lac-Cer synthase, decreased drastically upon differentiation of 3T3-L1 preadipocytes. The analysis of the transcriptional mechanism of the β4GalT5 gene demonstrated that the core promoter region is identified between nucleotides −299 and −1 relative to the translational start site. During adipocyte differentiation, the expression levels and promoter activities of the β4GalT5 gene decreased dramatically. Since the Specificity protein 1 (Sp1)-binding sites in the promoter region were critical for the promoter activity, it is suggested that Sp1 plays an important role for the expression of the β4GalT5 gene in 3T3-L1 cells. The gene and protein expression of Sp1 decreased significantly upon differentiation of 3T3-L1 preadipocytes. Taken together, the present study suggest that the expression of the β4GalT5 gene decreases through reduced expression of the Sp1 gene and protein upon differentiation of 3T3-L1 peradipocytes to adipocytes, which may lead to the decreased amounts of Lac-Cer in 3T3-L1 adipocytes. Escitalopram, a selective serotonin reuptake inhibitor (SSRI), may induce seizures, particularly in epileptic patients. In this study, we investigated the effect of escitalopram in Nav1.2 voltage-gated sodium channels (VGSCs) transfected HEK293 cells. Nav1.2 VGSCs current decreased by approximately 50.7±8.3% under treatment with 100 µM escitalopram. The IC50 of escitalopram against Nav1.2 VGSCs was 114.17 µM. Moreover, the treatment with 100 µM escitalopram changed the voltage-dependence of inactivation and the voltage at half-maximal inactivation shifted significantly from −50.3±3.7 to −56.7±6.0 mV toward negative potential under treatment with 100 µM escitalopram. Surprisingly, the treatment with 100 µM escitalopram also changed the voltage-dependence of activation and the voltage at half-maximal activation shifted significantly from −13.8±4.6 to −21.5±3.9 mV toward negative potential under treatment with 100 µM escitalopram. These findings suggested that escitalopram might be able to inhibit Nav1.2 VGSCs current and affects both activation and inactivation states of Nav1.2 VGSCs. Shiga toxin (Stx) is a main virulence factor of Enterohemorrhagic Escherichia coli (EHEC) that causes diarrhea and hemorrhagic colitis and occasionally fatal systemic complications. Stx induces rapid apoptotic cell death in some cells, such as human myelogenous leukemia THP-1 cells expressing CD77, a receptor for Stx internalization, and the induction of apoptotic cell death is thought to be crucial for the fatal systemic complications. Therefore, in order to suppress the fatal toxicity, it is important to understand the mechanism how cells can escape from apoptotic cell death in the presence of Stx. In this study, we isolated resistant clones to Stx-induced apoptosis from highly sensitive THP-1 cells by continuous exposure with lethal dose of Stx. All of the ten resistant clones lost the expression of CD77 as a consequence of the reduction in CD77 synthase mRNA expression. These results suggest that downregulation of CD77 or CD77 synthase expression could be a novel approach to suppress the fatal toxicity of Stx in EHEC infected patient. Natural killer (NK) cells play an important role in tumor immunity and infection control. The natural cytotoxicity receptors (NCRs) NKp46, NKp44 and NKp30 are involved in the control of the activation of NK cells. Few reports have investigated the ligands of NCRs. We previously reported the NCRs binding affinity to heparin and glycosaminoglycans. We also showed that multimeric sialyl Lewis X-expressing transferrin, secreted by human hepatoma HepG2 cells, binds to NKp46 and NKp44, but not to NKp30. 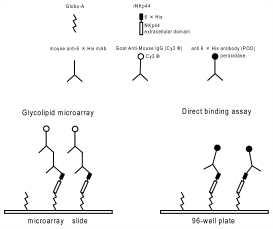 In this study, we investigated the binding between NCRs and glycolipids. The possible binding of glycolipids to NCRs was screened by microarray, using the recombinant extracellular domain of NKp46, NKp44 and NKp30 tagged with 6×His (rNKp46, rNKp44 and rNKp30). We found that rNKp44 binds to Globo-A. However, we did not detect the interaction between rNKp46 or rNKp30 and any of the glycolipids investigated. Direct binding assays supported the results of the microarray screening. Therefore, we concluded that Globo-A is a novel ligand for NKp44 but not NKp46 and NKp30, and showed differences in the ligand selectivity of NCRs. Daisaikoto Extract, a Kampo medicine listed in the Japanese pharmacopoeia 17th edition, is clinically used to treat obesity and related symptoms. Lipid metabolism is closely related to obesity, and pancreatic lipase inhibitors are therefore regarded as effective for the treatment of obesity. Although Daisaikoto has shown promise in the treatment of obesity, its mechanism of action has yet to be elucidated. 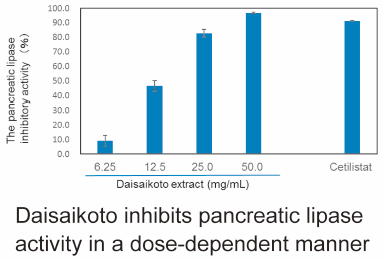 In the present study, we found that Daisaikoto extract inhibits pancreatic lipase activity in a dose-dependent manner and decreases serum triglyceride levels in mice. To determine the crude drugs responsible for lipase inhibition, 8 variants of Daisaikoto extract without one crude drug were prepared and evaluated for lipase inhibitory activity. The lipase inhibitory activity of the Daisaikoto extract was reduced by excluding Scutellariae Radix (SR), which was found to inhibit lipase activity with an IC50 value of 1.70 mg/mL. In conclusion, Daisaikoto represents a natural medicine, in particular SR, capable of inhibiting pancreatic lipase and lipid absorption. The duration of transgene expression from plasmid DNAs is important for gene therapy with nonviral vectors. In the present study, various cytosine-phosphate-guanine (CpG)-free and CpG-containing transcription regulatory sequences were introduced into plasmid DNAs with a CpG-free backbone. The transgenes encoding mouse secreted alkaline phosphatase and Gaussia princeps luciferase, which are both apparently non-immunogenic, were used as reporters. The plasmid DNAs were injected by the hydrodynamics-based method, and the expression was monitored for 28 d. All transcription regulatory sequences achieved long-term expression, with different expression levels depending on the sequences themselves. 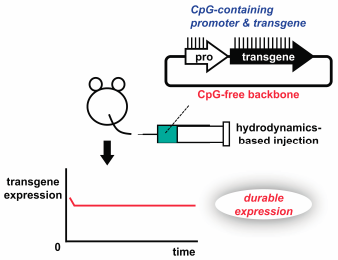 These results suggested that durable transgene expression at the proper level can be achieved with plasmid DNAs containing the CpG-free backbone.